John Bidwell was born in Chautauqua County, New York on 5 August 1819. His family moved to Erie, Pennsylvania in 1829 and to Ashtabula County, Ohio in 1831. He attended country schools and the Kingsville Academy in Ashtabula. Bidwell moved to the Sacramento Valley of California late in 1841, after teaching school in Ohio and Missouri. He worked as a ranch hand and a miner. Bidwell attained the rank of Major while participating in the war with Mexico. He served in the California state senate in 1849, supervised the census of California in 1850 and again in 1860, was a delegate to the 1860 national convention of the Democratic party, was appointed brigadier general of the California Militia in 1863, was a delegate to the national convention of the Republican party in 1864, and was a Republican member of Congress 1865-1867. Afterward, Bidwell turned to farming. He ran for Governor of California in 1875 on the Anti-Monopoly ticket, presided over the Prohibition Party state convention in 1888 and was the Prohibition candidate for governor in 1880. The Bidwell/Cranfill ticket received 271,058 votes in 1882, or 2.3% nationwide. That was the largest total vote and highest percentage of the vote received by any Prohibition Party national ticket. John Bidwell died at Chico, California on 4 April 1900 and is buried in Chico Cemetery. Hunt, RD (1942)John Bidwell; Prince of California Pioneers: Caldwell (Idaho), Caxton Printers. Royce, CC (1906)John Bidwell; Pioneer Statesman, Philanthropist: A Biographical Sketch: (published at Chico). 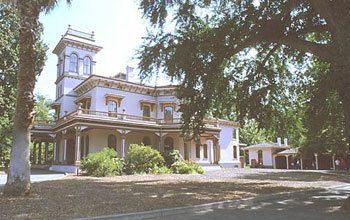 Bidwell's home at Chico, California is now the Bidwell Mansion State Historic Park, under the management of the California Department of Parks and Recreation. It is adjacent to Chico State University. Mrs. Bidwell's will left the house to the College Board of the Presbyterian Church of the United States of America. The Church was unable to establish a college, however, and the property was passed to (then) Chico State Teachers College. It was transferred to the Department of Parks & Recreation in 1964. Historic Bidwell Mansion stands today as a memorial to the Bidwells and celebrates, through their memory, those qualities of the human mind and spirit -- enlightenment, generosity, concern for the well-being of humanity -- that gave beauty, meaning, and purpose to their lives. The Bidwell Mansion Association was organized in 1960 to preserve and present the house and grounds. For more information, write: Bidwell Mansion Association, 525 Esplanade, Chico, California 95926; telephone 530-895-6144; visit now2000.co/chico/attractions.shtml or norcal.parks.state.ca.us. Bidwell went to California with the first overland expedition. During the Civil War, Bidwell was appointed a Brigadier General in the California Militia, but he did not see combat. Bidwell’s politics were unsettled: He was a delegate to the Democratic National Convention in 1860. In 1864, he was a delegate to the Republican National Convention. He afterward served one term in Congress as a Republican, but did not seek re-election. Instead, he concentrated on farming. Finding the lure of politics irresistible, Bidwell ran for governor of California on the Anti-Monopoly ticket in 1875. He then switched to the Prohibition Party and presided over our 1888 California state convention. He was our candidate for governor in 1890. The sixth Presidential candidate of the Prohibition Party, General John Bidwell, was born in Chautauqua County, New York, August 5, 1819, of New England [parentage. His education was received in the Kingsville Academy, at Ashtabula, Ohio, where he had gone with his family under the influence of the “Western fever.” Early in 1839, in his 20th year, he went farther West and located first in Iowa, then in Missouri, going to its extreme Western frontier. N 1840 he went with the first party of white men to California by way of the Sierras. He was closely ide notified with the opening up of the far West, especially the State of California, having been associated with Freemont in his explorations, and with Stockton and Kearney in their conquests, and having been the first man to announce the discovery of gold to the then small town of San Francisco. He was elected to the first constitutional convention in 1849, and to the first senate of California that same year. At the Charleston Democratic convention in 1860, he was the only California member who remained loyal to the Union. During the entire war, he commanded the Fifth Brigade, California militia. In 1864 he was a delegate to the national Republican convention. Elected the same year to the 39th Congress, he was chairman of the committee on Agriculture. In 1875 he was nominated for governor on an anti-monopoly ticket and received nearly 30,000 votes. He was a member of the anti-Chinese convention at Sacramento in 1886, and stood uncompromisingly in favor of maintaining the laws and treaties of the United States. Four years later he was the Prohibition candidate for governor of California, receiving the indorsement of the American Party. At one time he was engaged in wine-making, but, becoming convinced that instead of pure wines being conducive to temperance, as he had supposed, they were in reality making drunkards, he dug up his wine grape-vines, gave his best wines to a San Francisco hospital for medicinal use, made vinegar of the poorest, and went out of the business forever. At the Cincinnati convention in 1892, he was nominated by the Prohibition Party for President of the United States, with J.B. Cranfill as his associate. 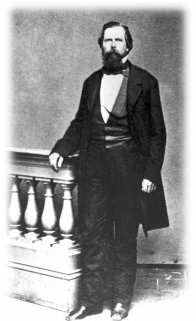 General Bidwell is to-day a man of considerable wealth, but is known and beloved throughout California for his charities, benefactions, and general public spirit. He lives with his wife, who is also known and beloved far and wide, on a magnificent estate at Rancho Chico, California.